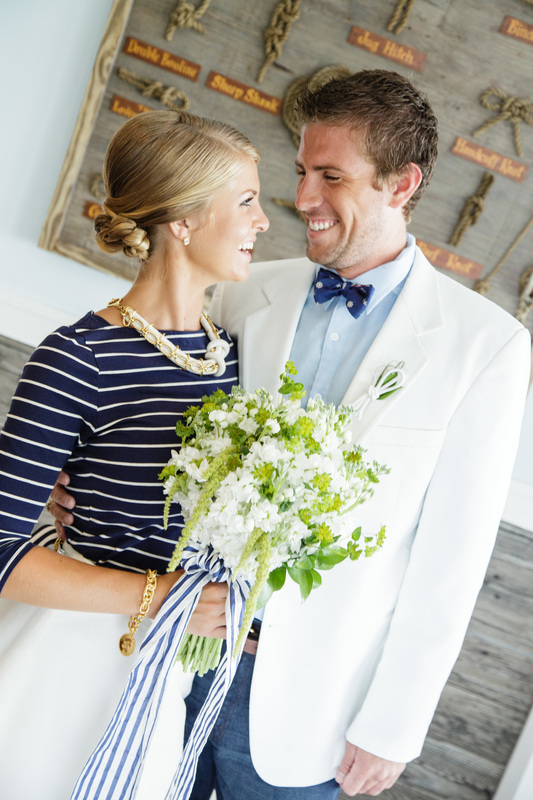 Preppy nautical weddings abound in the Lowcountry but Scarlet Plan & Design and The Click Chick Photography rocked the boat with this wedding coastal inspiration! When Mackenzie, THE Click Chick, and I first started talking about doing a shoot together we knew it had to be nautical and it had to be at Charleston Harbor Resort & Marina (aka CHRM). We're both obsessed with all things coastal so it was a natural fit and the perfect venue for our Nautical South Shoot. 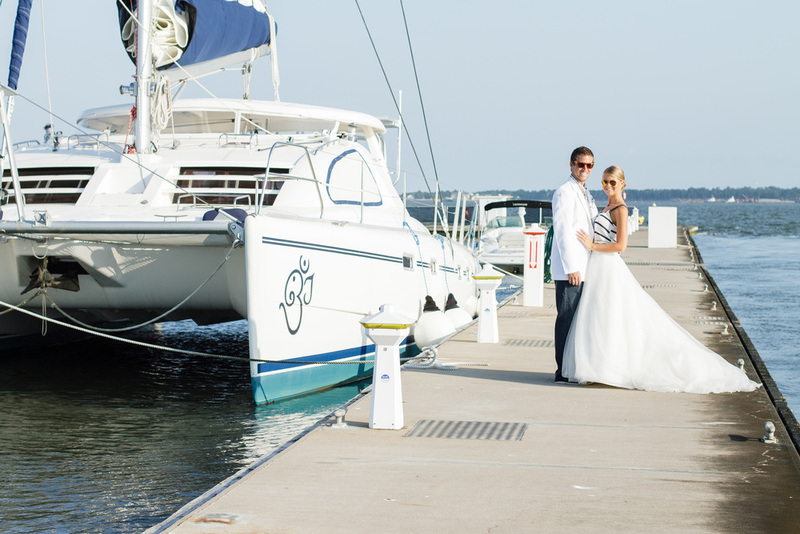 We started with the very nautical navy and white as our base colors in the palette and used a fun citron green and a deeper emerald green as an unexpected pop of color throughout the entire shoot. After the color choices were made we started assembling a team of awesome, creative vendors perfect for pulling off the incredible shoot we're about to share with you! Catering and mixology was done on site and was mouth watering to say the least! With the stunning Kristen Cook (AKA the real Miss Charleston!) as our bride and Citadel alum Ben Hebel as our handsome groom and professional ballet dancer Crystal Wellman as our Maid of Honor, our fake wedding party was ready to go! Can you believe how gorgeous they all look together? My biggest piece of advice given to all my couples is to look into your own lives for inspiration and to stay true to yourselves to create a memorable and unique wedding that is completely YOU! as always, happy planning my loves! Custom made oyster knives make the perfect bride & groom gifts for the nautical couple! Custom designed invitations sporting real compasses were absolutely perfect for helping guests find their way to the wedding! 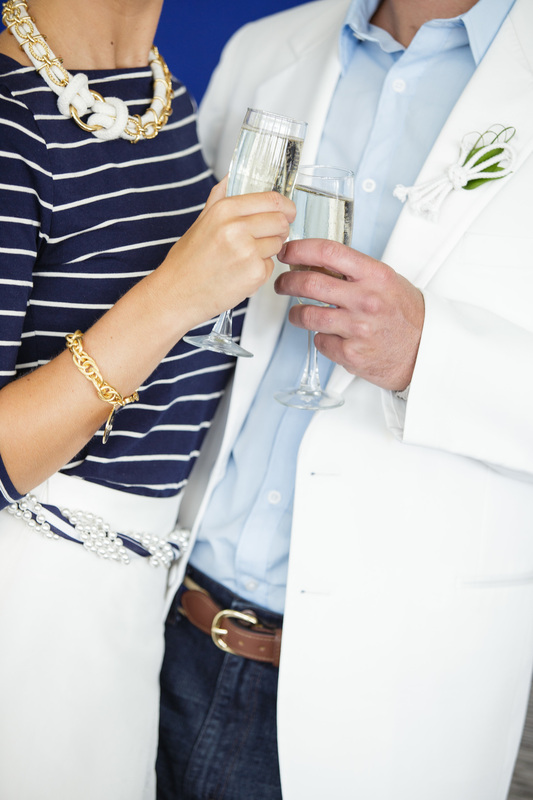 We opted to skip the traditional flower boutonniere and use a nautical knot instead. Believe it or knot (see what I did there? ha!) 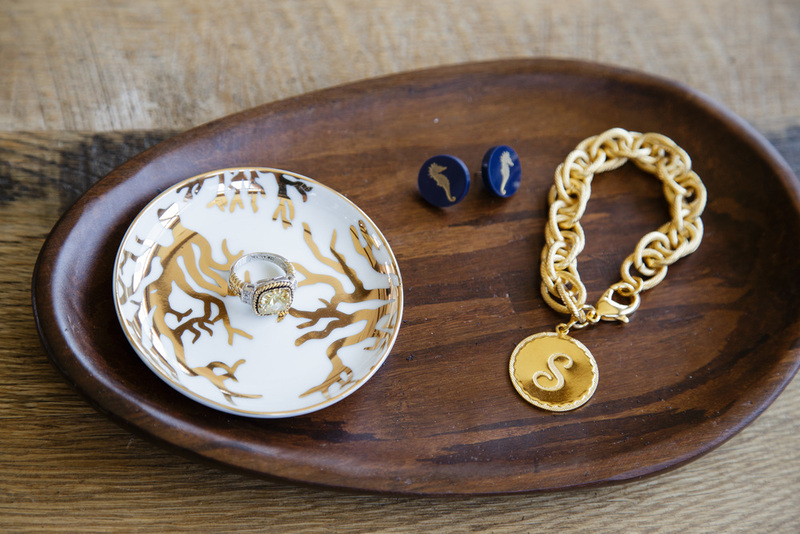 that gold anchor is an earring! The gals at A Signature Welcome worked with us to craft a welcome bag we'd LOVE to give our own guests! They used our color palette paired with perfectly curated gifts sure to make your guests feel welcomed and at ease during their weekend in the sun with you at your wedding! The morning of your wedding don't forget to bring one of your fiance's button down shirts to wear while you're getting your hair and makeup done and for all those sweet "getting ready" shots with your ladies! Ah, the details...the stunning engagement ring with the citron stone was on loan from a private collection and is unavailable for purchase at this time (insert sad face here! ), but everything else seen here can be yours! 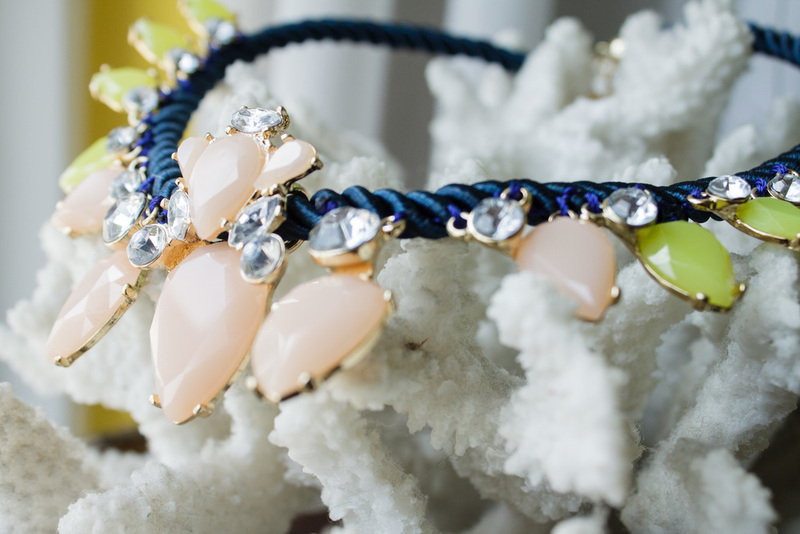 All jewelry was curated by Bridal Stylist Alden deHart for our shoot and can be yours simply by booking her services! See our Styling page for more info. I wanted to do something completely off the wall but still wearable for the bride's gown so I paired a huge tulle ball-gown skirt from Gown Boutique of Charleston with a navy and white striped top from Target! When we started getting Kristen dressed we realized that we needed a belt around her waist so Alden used a fabulous pearl necklace wrapped in a grosgrain navy and white striped ribbon and it was perfect! And don't even get me started on how much I adore that rope necklace! 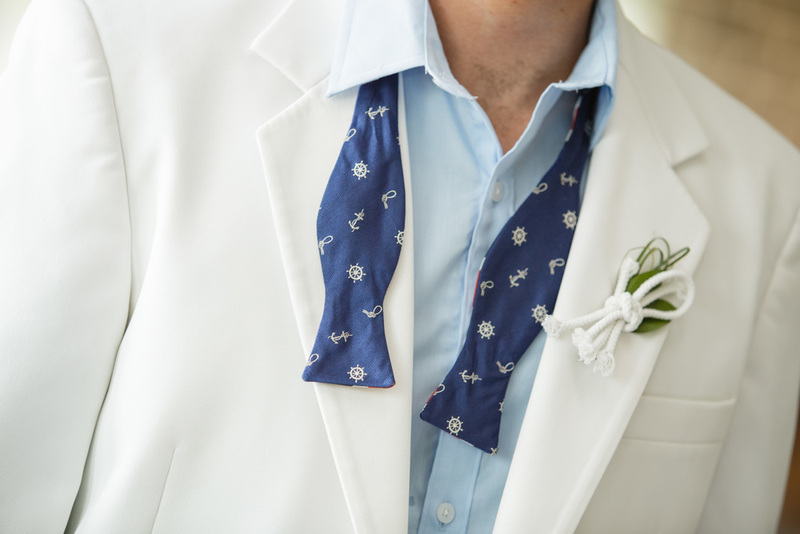 In sticking with our nontraditional wedding attire, we had Ben rock dark washed jeans paired with a pale blue button-down and a crisp white tuxedo jacket. 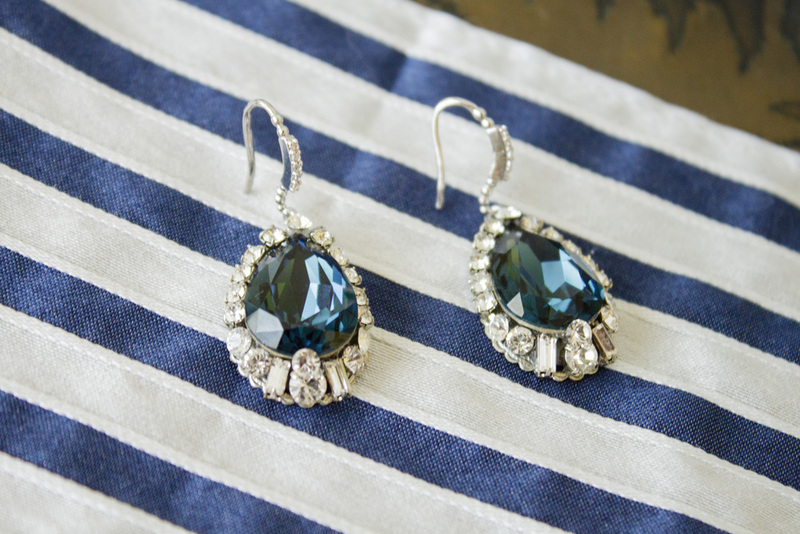 It was the perfect choice for our seafaring couple! This is probably one of my favorite images from the entire shoot. 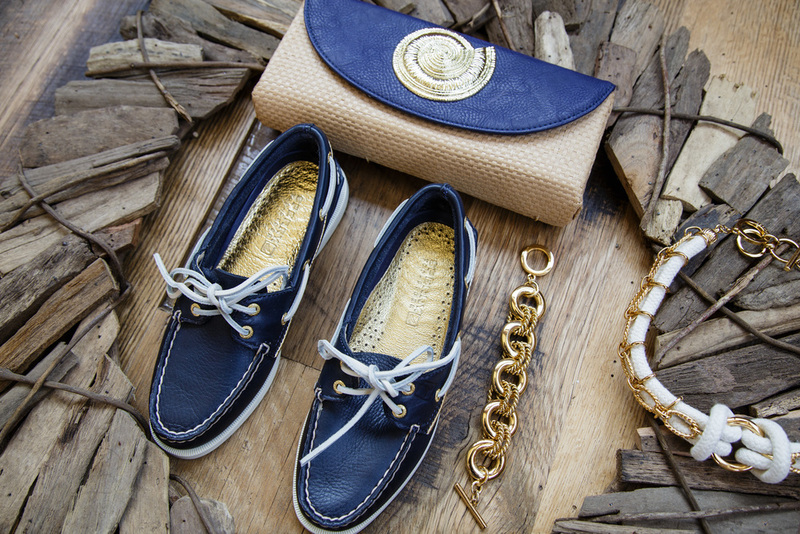 All 3 of the models wore custom navy and white Sperrys and they could not have been more perfect! I mean, boat shoes for a nautical wedding?! Obvi! And wouldn't they make the perfect gifts for your wedding party? A live sketch artist to capture your wedding day and provide a little entertainment for the guests is one way to go when you want to stray from the expected at your wedding! Y'all, that's a real working cannon from the 1800's that my sweet hubby's buddy let us borrow. That little thing must weigh about 70 freaking pounds! Thanks for helping us get that out there, Snyder! And thanks for letting us borrow it, Chris! See that beautiful catamaran in the background? We shot our next (and final) scene aboard her and you're going to love the unique Grand Exit "vehicle" we chose for this faux wedding! For our Grand Exit aboard the OM catamaran we took Kristen out of the boatnecked 3/4 sleeved shirt and rope necklace and put her in a fun white and blue tank top and a more casual anchor necklace. We changed Ben's solid blue shirt to a fun floral printed shirt from Banana Republic. Captain Banff Luther sailed us out around the peninsula, around the harbor and all over Charleston treating us to a KILLER sunset and unparalleled views of the Battery and all the way up to Fort Sumter. I'd highly recommend booking a cruise on his cat with your friends ASAP! What boat trip would be complete without someone pretending to be King of the World? Could these two be any more gorgeous together?! I spy the Charleston Battery in the background!